Study Examines Organic Food Purchasers. A recent survey of organic food purchases conducted by Equation Research revealed that about 65 percent of Americans have tried organic foods and beverages, up from 54 percent in 2003 and 2004. While the demand for conventional grocery products has grown between 2 to 3 percent annually, the same demand for organic foods has grown by 20 percent and will continue to grow. In fact, 27 percent of the national sample of 1000 find that they eat more organic products as compared to a year ago. 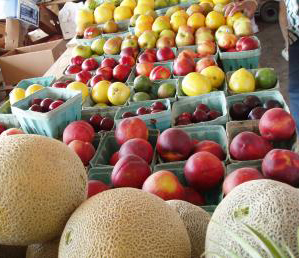 18% of survey respondents say they buy their organics at farmer’s markets. Photo of Minneapolis farmers market by Bryann Schlough. So if more than half of Americans have tried organic foods and beverages, why isn’t organic food mainstream? According to the survey, it’s because of:. Of the Americans who regularly consume organic foods and beverages, the study has found that there is a discrepancy of beliefs in the benefits of organic foods between consumers who regularly eat organic versus those who chose organic once in a while. Whether you agree or disagree with any of these values, educating yourself about organic foods will benefit you when making smart food purchases. Click here to read our monthly column, Organic Matter. Holiday Season Calls For Internet Shopping. Hitwise, an online market research firm, has found that while shopping for gifts is normally a popular online activity, many seek web advice for home entertaining and eating during the holiday seasons (just come to TheNibble.com!). From recipes to recommended products, consumers are utilizing the Internet more than ever for festivities during the peak holiday months—particularly October through January. 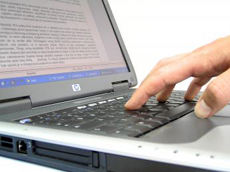 According to the study, U.S. visits to retail websites accounted for 8.95 percent of all visits to the Internet. The Internet can surf the world for entertaining tips, food, and recipes that will help you during the holiday seasons. Photo by Paul Pasieczny. Forty-eight percent of search engine visits for the week ending November 12, 2005 hit Food and Beverage Reference sites. In the same period, Shopping & Classifieds - Grocery and Alcohol sites had 30 percent of visits. Hitwise suggests that these results show that multiple searches with many generic terms show that people aren’t limiting themselves to one certain site, but are trying to locate the right recipe or item. Specialty Food Finds an Online Niche. We aren’t surprised that many more American consumers are seeking out specialty foods, especially with the number of delicious products we taste everyday. According to Entrepreneur magazine, more and more 25 to 34 years olds are turning to the web for specialty foods, from fancy cheeses to gourmet sugar-free sweets. Ron Tanner, vice president of the National Association for the Specialty Food Trade finds that many of the young consumers these days tend to treat themselves daily, contributing to the popularity of specialty foods. The retail specialty food business has grown 17.9 percent between 2002 and 2004. Tanner explains that it is now a $24.7 billion industry that has even more potential for growth. 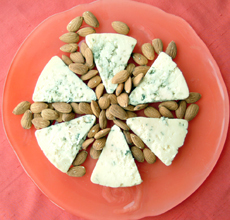 Younger consumers have learned to enjoy specialty foods, including specialty cheeses like this international award- winning Smokey Blue from Rogue Creamery. Click here for our review. Photo by Gina Erdmann. For example, 1-800-Gourmet, an online specialty foods wholesaler and retailer that offers over 3,000 fancy food items, will hit six-digit sales figures for 2005. Unexpectedly, since women are generally the purchasers of food, the majority of their customers are men. Click here to return to our November Table of Contents to read our reviews on a number of specialty foods that will expand your food world with just a few clicks of your mouse. Thanksgiving Dinner Restaurant-Style. While most Americans will enjoy home-cooked feasts that have taken hours hours to prepare, the National Restaurant Association reports that 11 percent of Americans choose to dine out and more than 50 percent purchase take-out meats or sides to enhance their dinner. The Association’s research finds that smaller households, families without children, young adults, and males tend to be the restaurant customers on Thanksgiving Day. The reasons given tend to be obvious: no preparation, cooking, or cleaning. Another alternative to restaurant dining is purchasing specialty foods that make gourmet feasting quick and easy. Click here to return to the Table of Contents to read about delicious foods you can buy, not make, that make your dinner spectacular. Eleven percent of Americans would rather dine at restaurants than enjoy the scent of roast turkey wafting through their homes. To read about heritage, organic and wild turkeys, click here. More Chestnuts to Roast on an Open Fire. According to a market analysis done by researchers from the University of Missouri Center for Agroforestry, the American chestnut market is a relatively new industry that has yet to grow. Results suggested that the chestnut business has only been around for a decade and only recently has been produced for commercial interests. A majority of the domestic farmers grow chestnuts has a side activity, and demand often exceeds supply. About 50 percent of the farmers only plant between 3 to 10 acres for chestnuts and 92 percent have trees that are under 20 years of age. Photo by Elisabetta Grondona. The current industry is a rebirth: in 1904, a blight traced back to imported Asian chestnut trees in the Bronx Zoological Park in New York City killed the trees and quickly spread. By 1950, the fungus had felled over nine million acres from Maine to Georgia, and the trees became virtually extinct. But Delmarvelous Chestnuts, in the Delaware peninsula, is hoping to contribute to efforts of researchers, universities, and growers to bring back the beloved nut. A couple-owned and run company, Delmarvelous grows 1,600 chestnut trees, hybrids between American and Asian (disease-resistant) chestnut trees, on their 30 acre farm. This year, they plan to harvest 8,000 to 9,000 pounds of chestnuts to directly sell to consumers. The dark, glossy nuts come in a variety of flavors depending on their origin, but they all tend to be low in fat (but high in carbohydrates). Chestnuts can be eaten raw, but they need a few weeks to settle or they may have an astringent taste. The best conditions for storage must not be excessively dry or overly damp: when it’s too dry, the nuts dry out and in damp air, they get moldy. The trick is to keep chestnuts in a closed paper bag inside the refrigerator and once chilled, transfer them to a sealed plastic bag punctured with a few holes, which allows them to keep for several months. 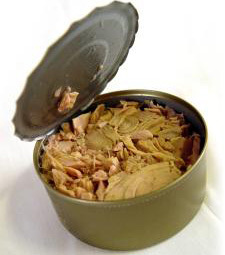 Enjoy them steamed, roasted, and boiled; but once they have been peeled and cooked, they must be kept in air-tight jars in the refrigerator for up to two months, or in the freezer for up to a year. Rinse the nuts and make a small X on the flat side with a very sharp knife. 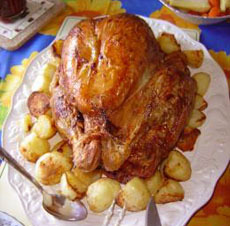 Roast in a preheated oven at 375°F for 20 minutes (this can also be done in a pan over an open fire). To microwave: Cook for about 2 minutes on high in a microwave-safe dish. Hot nuts peel more easily than cold ones (and are more fun to snack on warm), so when you remove them from the oven, keep them warm in a towel as you peel them. Or, serve them the old-fashioned way, and give everyone a serving of “peel-your-own” in a newspaper cone. Peanut Butter: As Popular As Can Be. 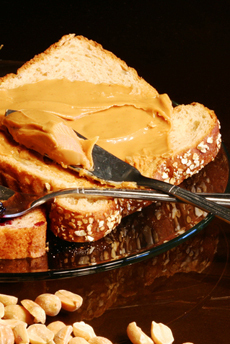 Peanut butter has been one of the staple products in American pantries for over a century. The affordable spread was made popular with the advent of sliced bread, making a gooey peanut butter sandwich a simple and delicious food for kids. According to The Boston Globe, today’s concerns over peanut allergies or obesity have not changed the popularity of peanut butter in American diets. The high-protein content and tasty flavor keep it both a kid-friendly and a multi-purpose product. Beyond sandwiches, peanut butter is popular mixed with noodles, baked into cookies, or paired with bananas; but over the years, peanut butter has truly evolved. Of course there are smooth, creamy, or crunchy, but you can also find specialty peanut butters combined with a variety of flavors like chocolate, raspberry, banana, even sun-dried tomato and curry. find an easy protein to digest. Two of the best peanut butters in America are made by artisanal companies P.B. Loco and Peanut Better. Click on their names for our reviews. Shrimp Takes First Place in Top Ten U.S. Seafood Consumption. Following up on the story about farmed shrimp written two weeks ago, seafood consumption in America hit a record 16.6 pounds per capita in 2004, up from 16.3 pounds per person in 2003, according to the most recent data from NOAA Fisheries. Seafood consumption totaled a record 4.85 billion pounds for 2004. The data below were taken from the National Marine Fisheries Service and calculated by Howard Johnson, H.M. Johnson & Associates for NFI. The American “Kobe” is a cross between Japanese Wagyu bulls and premium American Black Angus. It is relatively less expensive than the Japanese version, which come from pure-bred black Wagyu cattle that are fed on a diet of beer and barley, producing the sought-after marbled texture. Snake River now hopes to introduce Kurobuta pork, (kurobuta means “supreme black hog” in Japanese) to mainstream America, as they have championed American-style Kobe/Wagyu beef. Kurobuta’s origin dates back almost 300 years and the pork has been enjoyed in Japan for over a century; but most Americans have never even heard of it. Snake River Farms aims to get the word out by incorporating Kurobuta into popular products: Kurobuta hams have been on the market for a year; and last month the company released the Kurizo, a flavorful and tender Basque-style chorizo. Produced from Berkshire hogs, the pure-bred Kurobuta pork is known for its rich flavor, well-marbled fat, and deep reddish color—different from the “the other white meat” Americans are accustomed to. Fans of Kurobuta pork find the meat moister, juicier, and more supple than American pork. Kurobuta has won praise from some celebrity chefs and is making it onto menus in upscale U.S. restaurants. If you have a chance to try some, let us know what you think. You can click here or on any “click here to send us your comments” link, or use the Contact Us page on the bottom navigation. 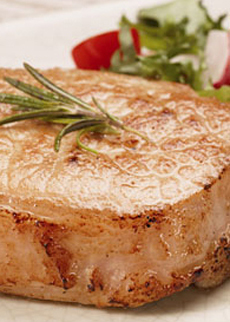 To read more about gourmet meats and poultry, click here. Le Marechal: The Newcomer Cheese. Corcelles-aux-Payernes in western Switzerland is the home to a relatively new cheese known as Le Marechal. Made from unpasteurized cow’s milk, Le Marechal is similar to Gruyere in taste and consistency, but is made in small batches that yield a 14-pound wheel, compared to a typical 60-pound wheel of Gruyere. Since it’s much smaller, Le Marechal aged at five months (the minimum age it is ready for consumption) has almost as much flavor and personality as a one-year-old Gruyere. Le Marechal is reminiscent of Gruyere and Tête de Moine. Photo courtesy of BuyCheeses.com. Le Marechal is made with partly skimmed milk, meaning the the cream is allowed to rise on the evening milk, and is then removed and combined with the morning milk prior to cheesemaking. The skimming is done to produce a cheese with a specified fat-to-protein ratio. For example, a high fat-to-protein ratio for milk usually makes a high-moisture cheese that is detrimental to aging process. After the raw cow’s milk is cultured, condensed with calves’ rennet, heated in 2,400 liter copper cauldrons, and drained, the curds are transferred to hemp fabric molds, stacked in wooden vats and pressed. The wheels are salted and, at the beginning of the third month, the cheeses are rubbed with Herbes de Provence (a mixture of thyme, oregano and other country herbs). They are regularly salted and turned during the minimum 5 month aging process. All the milk suppliers for Le Marechal are required to nourish their cows with flaxseed, a source of heart-protective omega-3 fatty acids. The omega-3’s end up in the milk, and the heart-healthy benefits have been claimed to extend to the cheese (...offsetting the heart-unfriendly benefits of the high fat content of cheese in general? We haven’t seen the ads). With a thin white wine-bathed rind, the center of Le Marechal has a smooth and firm texture, light gold in hue. A robust and rich nutty flavor with a lingering sweetness, the cheese has an herbaceous creamy finish. It you’re a Gruyere fan and see Le Marechal at your cheese counter, ask for a taste. Both are classic-tasting Swiss cheeses. (The cheese most Americans think of as “Swiss,” because it has holes, or eyes, is Emmentaler.) For more information about Swiss cheeses, see our Cheese Glossary. Organic Milk Industry Sees Growth. 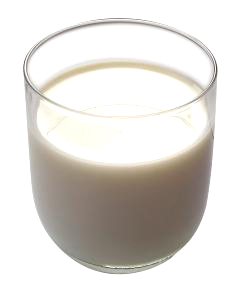 According to The New York Times, organic milk accounts for only a little over 3 percent of all milk sold in the United States. But while overall milk consumption has been dropping at 8 percent each year, organic milk is enjoying an annual growth rate of 23 percent, drawing the attention of the nation’s $10.2 billion-a-year dairy industry. According to Hartman Group, a research company based in Bellevue, Washington, milk has been considered a gateway to organic food. In addition to produce, milk is one of the first organic products consumers will purchase. Organic certification guarantees that the cows are not given any artificial growth hormones to produce milk, do not receive antibiotics, and do not graze on pasture sprayed with pesticides (or otherwise eat pesticide-laden food). of declining milk consumption. Photo by Ilianna. Since the flavor of milk is a reflection of the cow’s diet, the best-tasting milk comes from cows who primarily consume grass—and consumers who buy organic milk say they can taste the difference. A grass diet also produces “healthier” milk: it has quintuple the amount of conjugated linoleic acid, which studies have shown can assist in fighting against cancer. Research by the Danish Institute of Agricultural Research also found organic milk to be 75 percent higher in beta carotene, which is converted into Vitamin A in the body; and is two to three times higher in the antioxidants lutein and zeaxanthine. The study found that a pint of organic milk a day provides 17.5 percent of the required daily intake of Vitamin E for women and 14 percent for men. 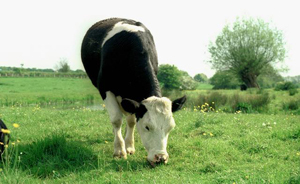 And grazing is healthier for the cows, compared to a grain diet. With claims of better taste, health benefits, and more ethical procedures of production, organic milk is one of the fastest growing niches in the dairy industry despite its higher price. Why not conduct your own taste test? Do what we did: buy four quarts of milk: organic and regular in both whole and 1%, and conduct a blind taste test. Pour small glasses of each and ask your friends or family to taste one pair (whole or 1%), then the other, and discuss if they prefer A or B. Do it at snack time and serve cookies, cubes of pound cake, or tea biscuits. The sweets don’t help with the test, but they make participants more willing! Click here to share your findings. Fresh Water Shrimp Industry Expands. To meet the increasing demand for shrimp, freshwater shrimp are being raised in 16 states, mostly in the South. Though there are still few commercial producers, domestic aqua-raised shrimp has the potential to become a big industry. Consumers have taken a liking to freshwater crustaceans, which have a slightly lighter and sweeter in taste than saltwater shrimp. 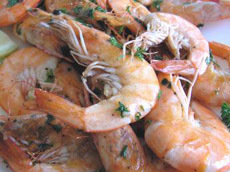 Dolores Fratesi, president of the Freshwater Prawn and Shrimp Grower organization, points out that over-fishing of the oceans and problems with pollution make farm-raised prawns a wholesome product that can be consistently derived from aquaculture, ensuring a steady supply of the popular crustacean. Critics claim that farm-raised shrimp have no flavor at all. William Small, director of marketing for the seafood division of the North Carolina Department of Agriculture, says that domestic, wild-caught shrimp are clean, safe to eat, have a firmer flesh, and offer fresh flavors that farm-raised shrimp lack. An additional issue is environmental impact. The downside of eating wild-caught shrimp is that it may deplete the supply of shrimp in salt waters. But shrimp aquaculture often uses a factory-farming model that douses shrimp with pesticides, antibiotics and other chemicals. In the United States today, shrimp is the top seafood of choice: 31 percent of supermarket seafood sales come from shrimp. Almost 90 percent of the shrimp sold in the U.S. is imported, and more than 80 percent of imported shrimp is farm-raised. To become more knowledgeable about the seafood you buy comes from here. Tea with Chewy Bubbles. Bubble tea in Taiwan and Hong Kong is as popular as soda and coffee is to the U.S. A unique beverage that originated in Taichung, Taiwan over 15 years ago, bubble tea is the hottest selling drink in Asia today. While the U.S. is still catching on to the trend, a handful of states, especially California, already have a number of different companies with hundreds of locations nation-wide that sell the drink. 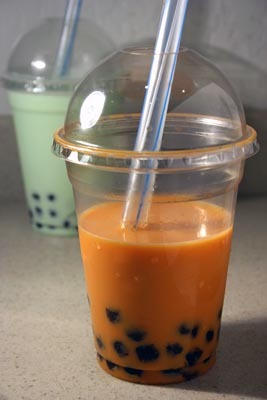 Bubble tea usually consists of a base of green or black tea, a fruit or other flavoring, and the “bubbles,” or tapioca “pearls,” the size of small marbles. The pearls, primarily black or dark brown in color, are generally made from a mixture of sweet potato starch, cassava root and brown sugar, which contribute to their chewy texture and sweet flavor. The pearls pearls also can be white or transparent depending on the ingredients used to make them. The tea is usually sweetened with sugar syrup and shaken with milk—much like a latte, but made with fragrant tea. Bubble tea is enjoyed either warm or chilled and served with a wide straw to enable consumption of the pearls while drinking the tea. Tempest Tea, a company with 75 varieties of loose leaf, bagged teas, and chais, is offering a seasonal Pumpkin Spice bubble tea for a limited time. Brewed from a Ceylon black tea and mixed with pumpkin, nutmeg, vanilla and seasonal spices, this is “fusion” bubble tea, a twist of Asian and American tastes. For more information about tea, click here to read our Tea Glossary. Click here to read Tea Facts. Substitute @ for (at)—we use this convention to avoid address-harvesting spiders.